Tell me what do you see here??? Wow.. Patience and perseverance got him yingbao. In weibo, the girl whose character was as a gty's daughter share that yingbao loved eating. She ate and ate and suddenly she had a stomach ache. Fsf was there at the time and was so nervous when yingboa was sent to emergency room for the whole night. awww.So sweet.Glad that she is fine now.FSF for sure is so caring .and as the article you posted say the director knows that they were already a couple.maybe the whole cast know also at that time,but they did great in public eyes not to be noticed.Hope there`s moreeeee of their BTS. what scandal?u mean his past dating? Gty/fsf eyes keep staring at ml/zly. Looks so happy, proud and preening like a peacock. Heard that their banquet will be held conjuction with after 100 days of their baby being born. I cant wait! I heard march could possibly be the due month.. so.. may banquet? Matching avatars.. The couples are more open in their affections. I really want to see ZLY with bridal gown .. Hopefully they will have a wedding ceremony after childbirth .. It's cute to see them soo affectionate with each other.. I noticed FSF sticks to ZLY much in her BTS.. The way he looks at her explains y he married her.. He didn't wanna let go of our girl!! 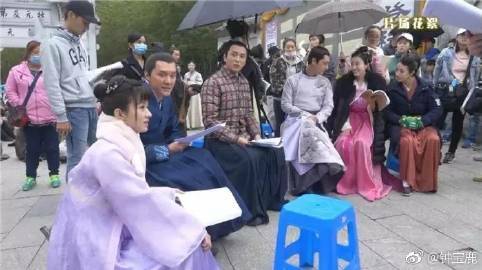 Why is there so little bts of them together.. their bts in monkey king 3 are soooo cutee!!!! I think we will get more of them together after marriage in the show.. But yes I enjoy watching their BTS in MK3 n also Minglan..
Maybe the really married in real through this filming?? Is this possible? ?They are not in hurry to do their marriage ceremony after announcing their marriage registration. And after wrapping up the filming, in the mid of april they went to bali for their honeymoon. When zly filming this drama, she was so stressed as the script was tough and she just finished filming ogt and went to This drama straight away without rest. Say, maybe she's not in the mood to playing around. Beside, she also didn't want to raise any suspicious as the talks about their relationship has gone rampant. What is this bali talk?? I thought she went on vacay to thailand with her family and fsf? Sorry, yes, they went to thailand in april last year. Yahh lahh..like I always on twitter/insta/weibo; just to keep updated of them on bts..
Ohh...everyday I go to YT just to watch their bts on MK3..